Sometimes I need a little protection. From malevolent spirits; from dragons; from windstorms generated by sad ghosts; from haunted ladies who walk weeping at the full moon. So I make these shapely, swirly amulets to hang in doorways. The charm is a Hamsa hand - an image of an open right hand, used for centuries to ward off dangers and the evil eye. 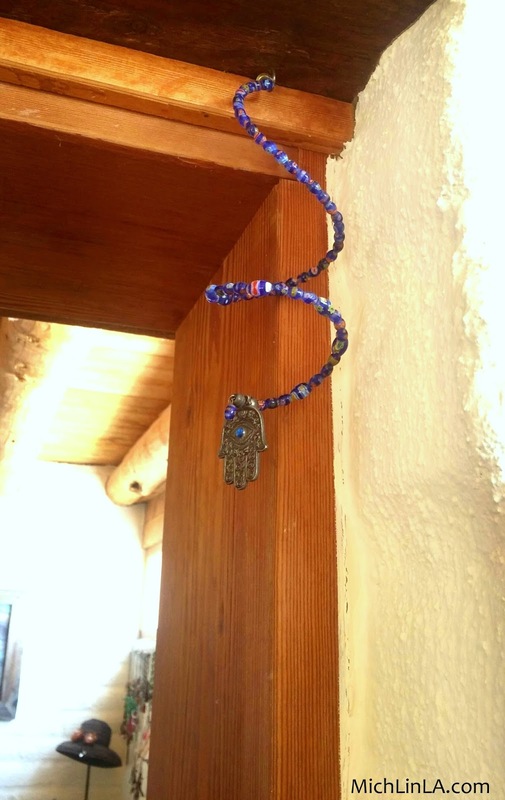 I also make them using the Nazar or blue bead evil eye amulet. 1. cut a length of memory wire and make a small loop on one end. 2. thread blue beads onto the wire until nearly full. 3. when you have about an inch of wire left, add your amulet, then one final bead. 4. with the last bit of wire, make another small loop to finish the strand. Optional: add a bead dangle to the loop for a little extra movement. In the version above, I chose antiqued silver rounds as the final two beads, bookending the pendant. 5. screw a cup hook into your door frame. Slip the top loop of the beaded strand onto the cup hook. That's it! Or make one for yourself, for when the Big Bad draws near. 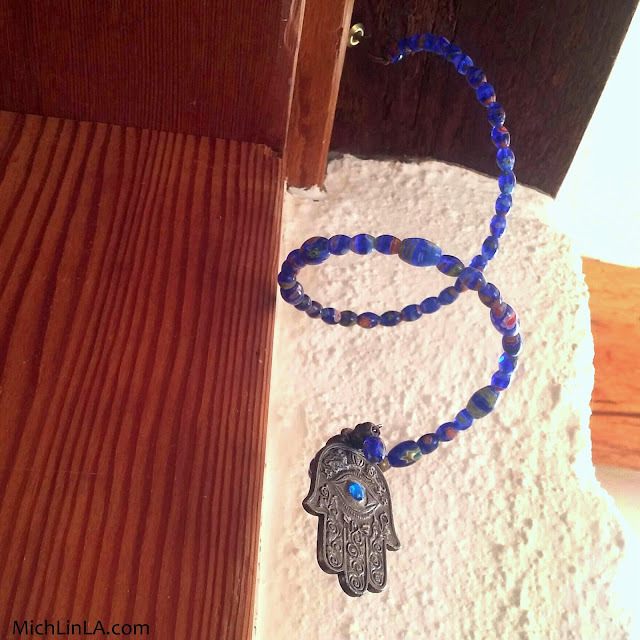 Love your creative "twist" on these and your very creative beaded evil eye. Oh I think I have one of these in my stash! Great idea and so pretty . Featuring when my little party opens up tonight! I made this and hung it on my front porch by the door. It's awesome! That is great! Thanks, Kate, really happy to hear that your house is now protected by powerful cuteness! This is beautiful. Khamsa means 5 in Arabic language. 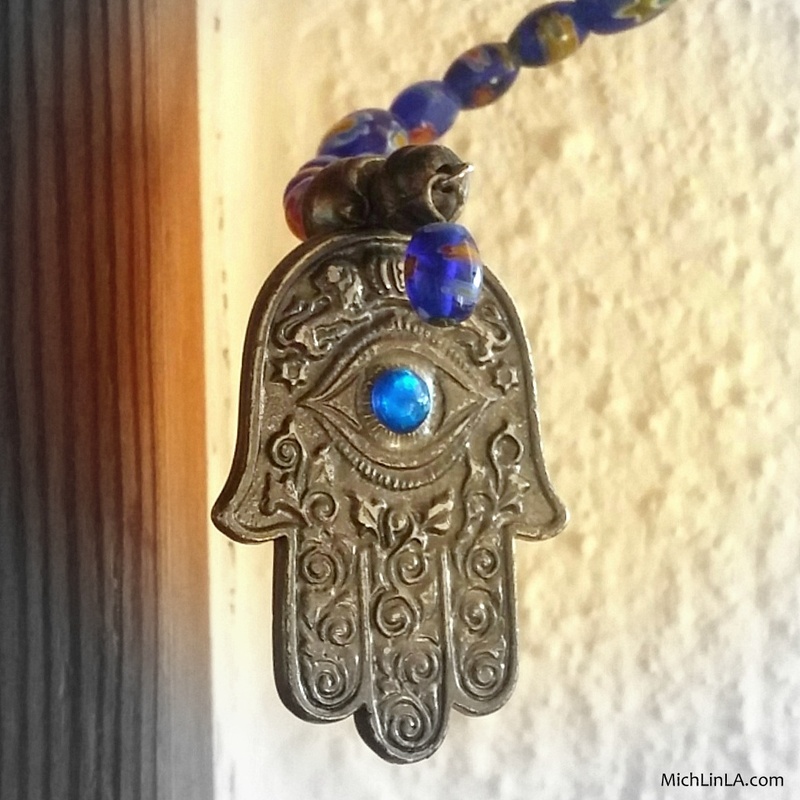 As the hand has 5 fingers so this hand called Khamsa. You did great job my dear!